Letter from John G. Kirkwood to LP RE: writes of his trip to France. Mentions that everyone at Yale was delighted with LP's recent lectures. 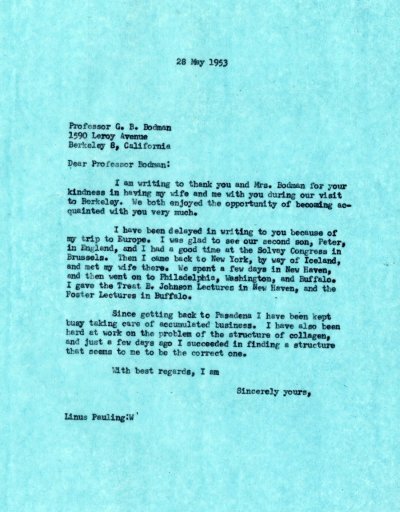 [previous letter from Prof. Kirkwood to LP February 2, 1953, letter of response from LP to Prof. Kirkwood June 3, 1953] [Filed under LP Correspondence: Box #198, Folder #12 (Kirkwood, John G.)]. Research Note Books of LP, RNB 28 RE: notes on the measurements of the (16, 16, a) helix. Measurement of 10 cm = 1Å;. LP discusses the construction of a large model. Records measurements of different atoms. [p. 11] [previous info. May 24, 1953, further info. May 30, 1953].